The Hull number is found on an oval “builders” plate mounted on the aft (cockpit) side of the forward end of the coamings (wash rail). Often this plate is missing, particularly in older boats. Replacement plates are available (see hardware). The hull number is also located on the forward face of the stern post (this is the wooden piece which runs halfway up the middle of the transom at the aft end of the cockpit). It is usually necessary to scrape and/or sand away some paint to “bring out” these numbers. With these numbers we can tell you at least the age and first owner of your Beetle Cat. Beetle Cats built between 1920 and 1945 were not numbered. 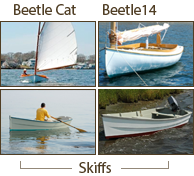 Hull numbering began in 1946 with Hull Number 1 being the first boat built that year. Note: For safety and best results always read product label before use. Fasteners for hardware are included with purchase of hardware item if noted in list price. All other fasteners used in the Beetle Cat are also available for purchase in bronze or stainless steel. Ask for prices. Note: Only steel or stainless steel fasteners should be used below the waterline in hulls built before 1973 (before hull #1536), otherwise rapid deterioration of the existing fasteners may result from galvanic action between dissimilar metals. Beetle, Inc. will accept unused new parts within 30 days of purchase for return or exhange, with the exception of custom and special order items. A 20% restocking charge may be applied, and shipping charges are non-refundable.